If you’ve been reading this blog the past few days, there’s been a lively discussion regarding the nature of Roberts’ research, of which I am not an expert to determine the truthfulness or falsity of what he presents. As such, while I appreciate the comments from Stephen Sniegoski and Mark York, I remain in my belief that Roberts sought to portray information accurately, and will do so until I can read York’s book and weigh the evidence myself. I do acknowledge, though, that no historian was 100% objective, completely unfettered by his own worldview and biases. Roberts, I am sure, and practically all historians (more some than others, though), struggle with this. And, to be fair, this is not unusual – we must all, when given facts, interpret them. At times, we can be spot on, and other times miss the mark. When it comes to Roberts, the subject of this blog and a writer I am rather familiar with, I believe he did strive to do history well and accurately. Thus, in light of the recent discussion, my tendency is to first give Roberts the benefit of the doubt. In his autobiography I Wanted to Write (particularly pages 166-169), Roberts discusses what brought him to begin writing historical fiction, and not just history. This journey began when his curiosity was piqued regarding his family’s role in the American Revolution and in the War of 1812. When he sought answers from his family, he came up empty of answers and overrunning with more questions. He then turned to histories for answers. I had tried to get some of these things straightened out in my mind by reading histories that purported to explain them; but in every case–not in most cases, but in every case–I found that the books explained nothing fully or satisfactorily. They were drab, dull, unconvincing, rich in omissions, and crowded with statements that couldn’t possibly be true (167). Before the summer ended I was disgusted beyond words by the incredible dullness and scantiness of so-called histories. I realized that I could never find out what I wanted to know…unless I assembled all the necessary information from every obtainable source; then put all that information together in a book in which characters acted and talked. That, it dawned on me, was what I must do. Even though nobody read what I wrote, it ought to be done, because nobody had every done it before–and there ought to be at least one book that would give the good people of Maine an honest, detailed and easily understood account of how their forebears got along. I hadn’t the slightest desire then to write what is known as an historical novel, not have I ever had any intention of doing so. In fact, I have always had a profound aversion to most historical novels, because the people in them aren’t real people, and neither act nor talk like anyone I’ve ever known (168). Based upon this, and other statements Roberts made elsewhere, I don’t think he sought to write a novel that happened to deal with history; I believe he sought to write history that was readable to the general public, and that means was through the novel. Later in I Wanted to Write, Roberts discusses the time when Oliver Wiswell was being considered for a Pulitzer, giving us a glimpse into how he viewed his own works. Roberts had received news that Oliver Wiswell had not received the Pulitzer, having been ruled out “on the ground that it wasn’t really a novel, but history disguised as fiction” (356). He would later write in one of his journals: “‘Apparently the Pulitzer Committee considers itself privileged to change the rules on literature as well as Pulitzer’s prize rules; but no matter what the Pulitzer Committee things or says, Oliver Wiswell will continue to be a novel as well as history” (356-57, emphasis mine). I believe what we see here is that Roberts did not see his work as fiction, nor did he see his work as primarily a novel and secondarily a history. I believe that Roberts truly believed he was writing a novel AND history; perhaps, based upon his earlier comments mentioned above, Roberts saw himself as writing a history through the vehicle of a novel. Thus, I don’t think it’s fair to say that Roberts embellished things for the sake of his novel. Did he get facts wrong? I’m sure he did. But to argue that it was due to personal bias or any other reason is to judge Roberts’ intent, which cannot be argued with 100% certainty, but rather to argue plausibly – the likeliness of Roberts embellishing fact for the sake of his novel or the factual error existing for other reasons. To argue Roberts embellished fact for the sake of the novel, then, is to place the burden of proof on the one making the claim, and this is a rather difficult claim to back, in my opinion. 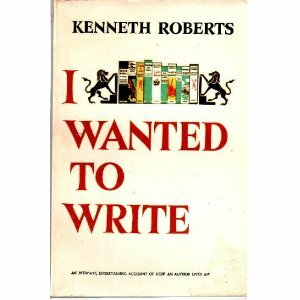 I Wanted to Write is an excellent glimpse into Roberts’ reasons for and motivation behind his writings. It is also a glimpse into the numerous hours (more like months, even years) he put into research before and during his work on a particular book. If what he relays in his autobiography is honest and of unselfish motivation, then I think we should read his works in light of what he tells us, and handle possible factual errors accordingly. With this said, I would like to reiterate how exciting it is to see Roberts’ work playing a role in today’s scholarship. Let’s hope that more follow York by taking Roberts’ works seriously and critically. Okay, so what I found wasn’t on a blog, but instead on Dartmouth’s library website. Nevertheless, I found a brief bio on Kenneth Roberts written by his biographer, Jack Bales (of whom I’ve written on in the past). This short bio is a great glimps into Kenneth Roberts the man. While Roberts was generally known as an opinionated, curmudgeonly man, this piece by Bales reveals that popular sentiment did not paint a full picture of Roberts. Roberts ended up receiving a letter from the president of Dartmouth (Ernest Martin Hopkins) which praised his works, thus serving as a turning point in Roberts’ career. This, then, brings us to an interesting piece of Roberts trivia: though Roberts was a native of Maine and loved Maine with practically his whole being, Dartmouth serves as the home of his works and correspondence because of Hopkins’ letter and Roberts’ receiving an honorary doctorate from Dartmouth.